Author Groupie – Page 2 – Enabling my addiction and encouraging yours one read and write at a time. Forget. This past week I filled in for the hub as an assistant to one amazeballs coach of my daughter’s basketball team. The players were engaged and genuinely having the time of their lives. One player begged for even more Ups and Downs (running of the stairs) after they had already completed Killers (line runs). His enthusiasm was contagious, and I couldn’t help but join him in the running of the stairs. At the end of practice, the team scrimmaged. Short a few players, Coach Sarah put me in, and I was pumped. Running from one end of the court to the other seemed anything but work. I wasn’t worried about counting my steps or wondering the number of calories I was burning; I was plain and simple having fun. With the busyness of life and adulthood, it’s easy to forget the joys of play. Because of that one practice, I am planning a women’s basketball pick-up game in an effort not to ever forget again. Thank you, Coach Sarah. You know your hub loves you when he comes home from a business trip bearing the latest novel in the Stephanie Plum series, Janet Evanovich’s Tricky Twenty-One. Not even knowing Evanovich’s latest installment of Mmmmmorelli and Ranger was out, I was beyond elated. Always hoping Stephanie Plum, the protagonist of this series, makes a final choice between the two hotties in her life, I must continue to read until there is a resolution. By book twenty-two, again, I was hoping for resolution, but (spoiler alert!) I’m not convinced with the “finality.” I wonder how many more I have to read until I finally, once and for all, know with whom Plum chooses. Entertaining as always with a mystery and much humor involving Grandma Mazur and Lula, for the love of humanity, please Evanovich put an end to my desire to know: Ranger or Morelli? Dwell. When I think of the word dwell, what immediately comes to mind is Dwell Magazine, an American magazine which explores the interiors and exteriors of modern design. The glossy pictures within this magazine show clean lines and a place for everything, and while reading, I think how soothing it must be living in such an existence. Then, I peer over the pages of the magazine and see a game of Monopoly in mid-play strewn all over the game table in our family room. I see a shredded bra and socks lying on the floor which our adorable Labrador Retriever fetched from the dirty clothes. I see dining room chairs splattered with grape juice stains, children’s artwork strung across the fireplace, and deep scratches in the hardwood where the girls rode their Plasma Cars in circles time and time again. I think to my myself; I wouldn’t want it any other way. Dwell. You know you’ve waited in the doctor’s office a long time if you are able to start and finish Sarah Fabiny’s Who Was Beatrix Potter?. This is exactly what happened to me this past week. Beatrix Potter, the author of the twenty-three “tale” books including The Tale of Peter Rabbit was not only a groundbreaking author, but also a trailblazer in women’s rights. Born in 1866 into a wealthy family. Potter was raised to be seen and not heard until she would eventually marry or simply stay at home and care for her aging parents. Those were her options. While her brother was sent to a boarding school to be schooled. Potter took art classes at the South Kensington Museum and excelled. Thankfully, Potter’s brother Bertram, while home from school on a visit, encouraged Potter to send out her drawings to publishers, and the rest is history. 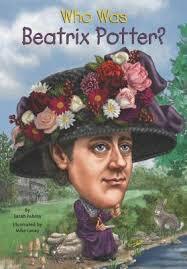 Although met with adversity and hardship along the way, Potter is a true example of someone who can achieve her dreams with hard work and determination as told in Fabiny’s Who Was Beatrix Potter?. Stacy Morrison’s memoir Falling Apart in One Piece, which focuses on the before and after of her divorce to her husband of ten years, intrigued me because at the time of the book’s publication, Morrison was editor in chief of Redbook magazine, and I am a magazine junkie. Set in New York City, Morrison and her then husband Chris had been together thirteen years with a new baby when one day Chris simply stated from the couch, “‘I’m done . . . I’m done with this,'” (3) and as Morrison further explains in great detail, he truly was. What ensues is candid writing revealing heartache, desperation, and uncertainty. Left to navigate solo a money pit of a recently purchased Brooklyn home, full-time childcare, one-sided attempts to resuscitate a dead marriage, as well as a newly acquired editor in chief position, I found myself having to take breaks from the reading in order to take a step back from all of the stress unfolding in Morrison’s life, so the fact she inevitably overcomes all of these obstacles is an inspiring feat in and of itself. Besides simply an exploration of her relationship with her then husband, Morrison also tells of the after effects of a divorce in regards to family and friends. What Morrison once considered “our friends and family” became “your friends and family” and “my friends and family,” further collateral damage. For Morrison, friends’ earnest attempts at support often fell short or simply added more ache to her already broken heart. Refreshing to read writing free of grammatical and mechanical errors, the one mistake I did find was how Morrison states, “I invited my family to my apartment on Sunday to join me for the very first proper Thanksgiving feast . . ..” (214), but then later writes “. . . Zach with me and my family for Thanksgiving dinner on Saturday” (215). Overall, a motivating look at how what one may first perceive as devastating, may, in fact, be an opening to a path one never knew existed. 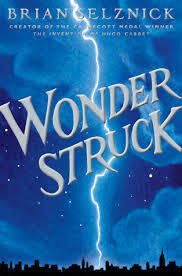 My youngest squirt was perusing the books in the library the other day when my oldest squirt suggested she read, Brian Selznick’s Wonderstruck. The oldest’s third grade teacher had read to the class Selznick’s The Invention of Hugo Cabret, and she had thoroughly enjoyed it. Seeing that his books are novels comprised of words and pictures, I asked how the teacher was able to show a class of 20+ eight and nine-year-olds numerous pictures interspersed with words and maintain control. She replied, “My teacher used the PolyVision Board.” Gotta love technology especially when used to enhance literacy . . . When my youngest cracked open Wonderstruck, great belly laughs could be heard from the backseat on our way home from the library as she watched the wolves approach closer and closer with every turn of the page. Seeing the novel had heft at over 600 pages, I was concerned it may have been too much for my seven-year-old until I flipped through the pages and saw the plethora of intricate drawings filled with much emotion. I figured it was worth a try. That evening I discovered my youngest in her bed, headband light on her head, reading intently, and repeatedly yelling, “Guess what page I’m on now? !” Needless to say, my oldest squirt hit it out of the ballpark with her recommendation. The tough part now was asking little sissy to part with Wonderstruck in order to sleep. Less than a week later, my youngest had finished Wonderstruck and sent me to the library for Selznick’s The Invention of Hugo Cabret. The pride she exhibited at having read a novel with such girth prompted me to read Wonderstruck, too. A cross between a picture book, a graphic novel, and historical fiction, I, too, was hooked with those wolves quickly approaching from page one and intrigued by pictures which did not match the storyline being revealed. Thus, the pictures represent a story in and of itself separate from the written word until the two join towards the end of the novel. Complex, mysterious, and informative, Selznick has created a new genre of writing, the graphic novel on steroids, which, I think, will engage even the most reluctant readers. Last week my hub was out of town for a couple of days, so I needed a quick read. 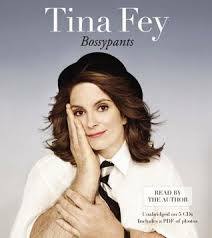 As always my sistah from another mistah came to the rescue with Tina Fey’s Bossypants. Classified as a memoir, Fey’s writing highlights various happenings in her life, but reads as more of a conversational piece on her world view based on her own experiences. Thus, as Fey writes, “For me this book has been a simple task of retracing my steps to figure out what factors contributed to this person . . .” (5). Fortunately for the reader, Fey reflects on her life with much humor and raw honesty. Fey begins by telling how she was a “‘change-of-life baby'” (7) for her “old parents” (7) as she arrives eight years after her brother. Then, at age five she is slashed in the face by a stranger which has since left a scar on her face (which I, as a fan, have never even noticed). Instead of elaborating on the circumstances regarding what must have been a traumatic experience for a young child, she offers her insight on what she has learned from people who do and do not ask about the mark on her face which reads as a fascinating perspective on human behavior. This, in turn, made me ponder my own interactions with people after my double mastectomy: which people couldn’t help but stare at my chest (not ever sure what they were looking for), which people offered their own experiences with breast cancer (even if it was a sixteenth cousin twice removed), and which people made me laugh great belly laughs (my favorite, by the way). What I walked away with after reading Bossypants is that we are not alone in our struggles and triumphs, no matter how many Golden Globes we win or don’t win. What we take away and learn from life is what matters in the end.